This is the first time in maybe 10 years that I've attempted to create a conworld, effectively from the ground up. Some people may have seen the basic sketch of a map I posted in the C&C Q&A thread, but I thought I'd go back a little bit further to try and make the world make a bit more sense than it might do if I just put mountains and oceans wherever the hell I wanted. 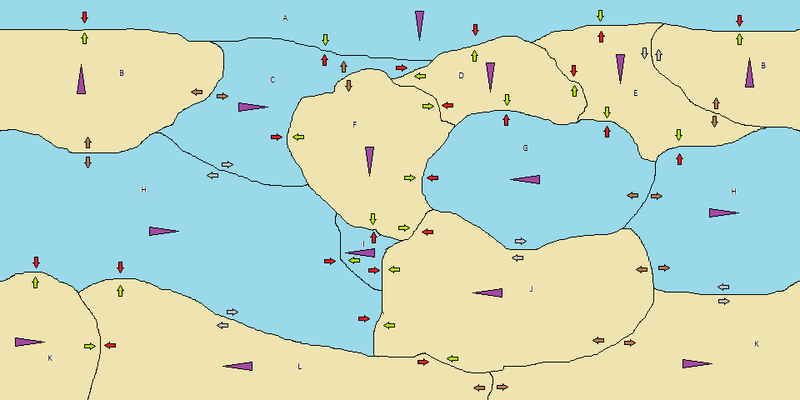 The purple triangles indicate absolute plate movement, with the narrower end being the "front" while the smaller arrows indicate relative plate movement at given plate boundaries. Light blue plates are oceanic while light brown (is that brown? I don't know ) plates are continental. Grey arrows indicate transform boundaries while brown ones indicate divergent ones. Red and green arrows indicate convergent boundaries with the red arrow indicating which plate is pushed down and the green indicating which is pushed up. There are likely a few issues here. For example, I'm unsure as the the plausibility of the movements of plates K and L.
I can't believe it's taken 2 weeks for me to get this done, but technically it's added up to maybe 1.5 hours of work, but real life got in the damn way again. I'm wondering if relative movement at plate boundaries can be moved out, roughly, by comparing the speed at which the plates are moving. Say, for example, Plate A was moving a a set value of 1 while B was moving at a relative value of 1.2, then the A-B boundary would be a divergent boundary, despite both plates moving in the same absolute direction. Or does that not make sense? Also, I'm still deciding on exactly where the actual continental crust of plates E and L will be, so some of those continental collisions, if I'm right in my reading, might actually just be subduction zones. Last edited by sangi39 on 16 Nov 2013 10:51, edited 1 time in total. Woah, is that world with a complete line of land blocking the sea I see? Sounds like a cool idea. Chagen wrote: Woah, is that world with a complete line of land blocking the sea I see? Sounds like a cool idea. 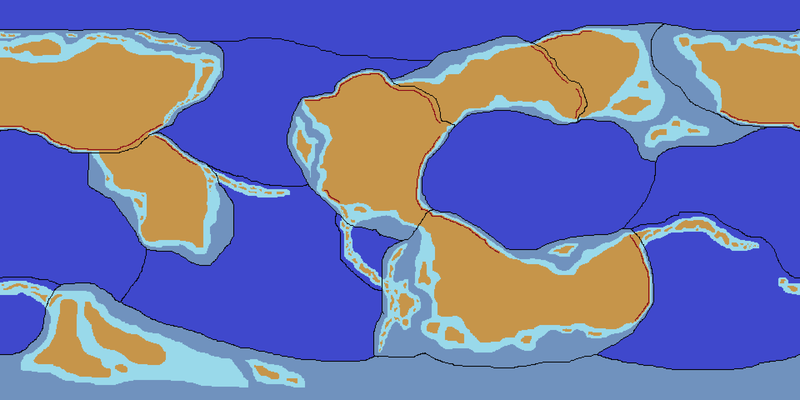 Possibly, but as mentioned over on the ZBB, what's shown here are the tectonic plates, not the actual continents, i.e. the continental crust. I haven't actually decided on where the actual continental land masses are going to be. My original sketch has Plate E being predominantly covered in water, so you could actually get from the equatorial ocean to the northern polar sea by that route. 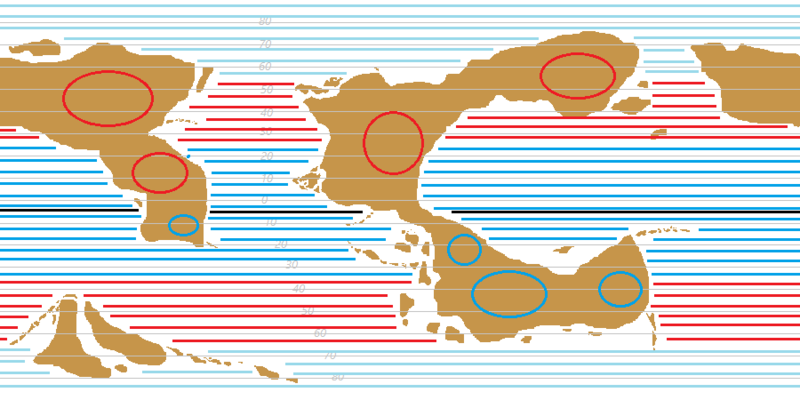 Similarly, only the "western" portion of Plate L would have any significant land-mass so you'd actually be able to circumnavigate the globe by travelling along the southern coast of the continent that would exist on Plate J.
I'm not entirely sure what the F-J boundary would look like, though. I get the feeling that it might be involve a shallow sea and a number of islands, so you could then go around the world by travelling between F and J as well. The only continental plates that would form a contiguous land mass, though, would be F, D and J.
EDIT: I may also bring down the "eastern" portion of Plate B so that it covers the equator (or add another continental plate to get the same thing) and then divide Plate H into two oceanic plates. I'm a bit annoyed at the moment that there's only one small portion of land that crosses the equator and I like a bit more than that. The dark blue and blue-grey areas mark out the areas of the ocean greater than 500m below sea level while the light blue areas are the regions of water that lie above 500m below sea level. 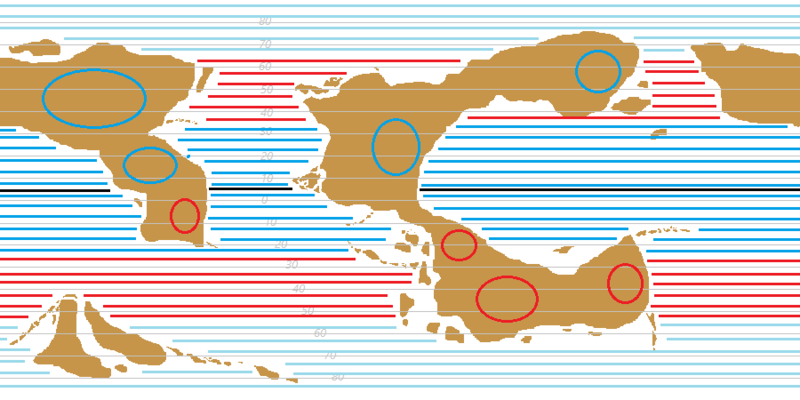 The green areas then mark basically all the major land masses on the continental plates above sea level with the dark brown lines indicating where mountain ranges resulting from current convergent boundaries would exist. 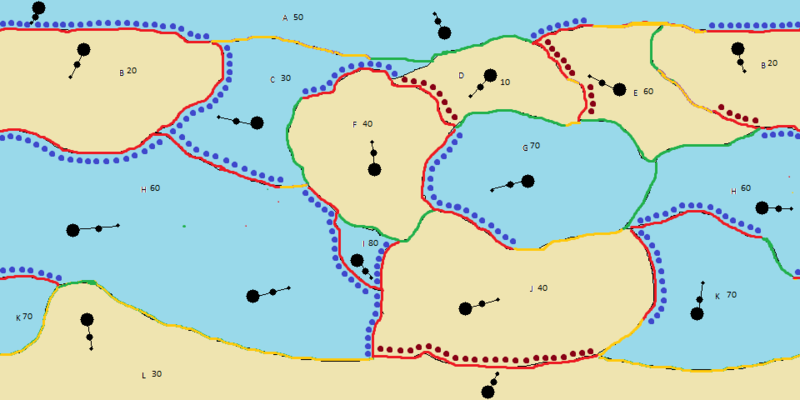 We now have the continents of Sirden, Mistaya, Hungas and Velkasta, formed upon what were originally plate J, the continental plate carved out of plate H and plates B and L respectively. Arenda is more complex, emerging from the collision of plates F, D and E.
We then also have the four oceans, the Central Ocean (formally Plate G), the Eastern Ocean (Plate K and the "eastern" portion of plate H), the Western Ocean (the "western" half of Plate H) and the Northern Ocean (Plate A). 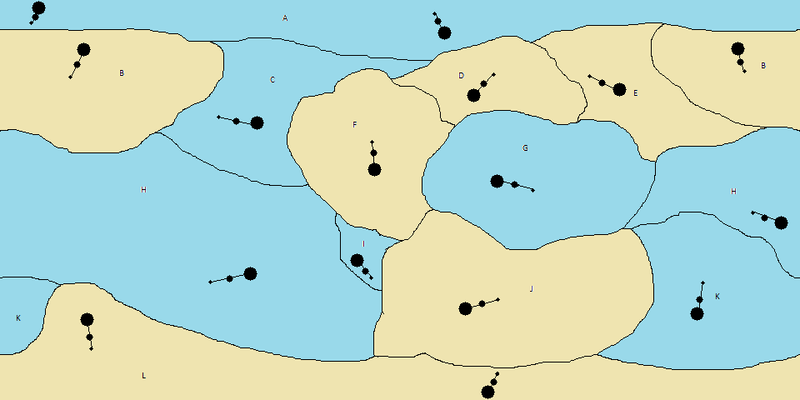 There are then the Southern Sea, covering the deeper areas of Plate L, and the Northern Strait, covering the deeper regions of Plate E.
The Northern Ocean and the Western Ocean will likely be divided by a volcanic island chain curving off from Mistaya slightly north of the equator while the division between the Western, Eastern and Central oceans are largely arbitrary at the current time, although, as you may have gathered, the distinction between "east" and "west" has been drawn around Sirden. However, it looks like two island chains will form along the old H-K boundary, so there is a chance that I might rename the Central and Eastern oceans, possibly to the Eastern and Southern oceans (if I do that, I'll likely get rid of the Southern Sea as a term and merge it into the Southern Ocean). This then means that all four of the world's oceans are divided by more visual means in the form of either intermediate continents or island groups, which is a bit neater I think. Thankfully, it's a lot less of a mess than the previous post, but from now on we can pretty much ignore that map for anything other than justifications regarding new features which might occur at, say, plate boundaries. I am planning on adding things like plateaus and mountain ranges resulting from previous geological activity, and eventually adding greater detail in regards to altitude (I mean 0 - 1500m covers almost the altitude range of Britain ) but this where I am at the moment. 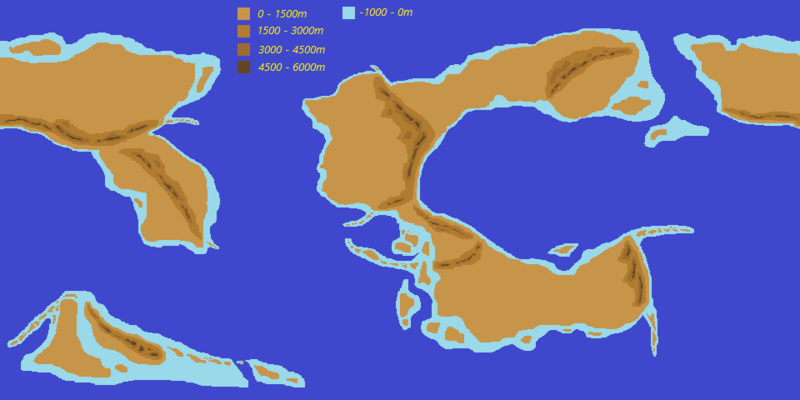 I also have this larger map, but it's just a blown up map so things some of the mountain ranges and island chains are a bit clearer. Oh, and I've decided to divide Arenda into two continents, with Arenda now referring the large mountain range running north to south and the area to the west of that while Konyur refers to the east-to-west orientated area to the east of this range, including the far-eastern mountain range and the area to the south of that. What do people think? Is there something that could be improved or is the whole thing just plain wrong? Also the other arrow in the same gyre. I'd begin by making your subtropical gyres larger. You have them basically up to about 30 degrees. On earth, 30 is more the midpoint, not the limit. 45 is probably more like the limit. And they probably won't be square - in addition to being a bit rounded, I think they tend to bulge in the east, almost more like triangles rather than squares. The south pacific gyre actually pushes down to around 60 degrees at its lowest point (which isn't quite its eastern margin, but closer to that than its west). The size probably also depends on the basin size - the south pacific gyre is a lot bigger (extends further south) than the south atlantic. Imagine the equatorial currents spraying all that water in a hose - the pacific hose is a lot more powerful, so the water ricochets further. Remember than currents aren't lines, they're big thick bundles of lines. Take the south pacific again - the current extends about 15 degrees. So, for instance, what you'll probably have in that bay in the centre-right is that there'll be a gyre within the bay feeding back into the western boundary current of the bits of the equatorial current that didn't enter the bay. And that goes for the west wind drift - there'll be a tendency for everything between about 40-50 and 60ish to be headed east, which includes the polar edges of the subtropical gyres, but not just them. That should do most of your map. The polar areas, unfortunately, are hard. On earth, we've got one where the question is almost moot, and one which is insanely complicated. In general, I'd bear in mind that south (/north) of 60 degrees, water will want to flow to the west, and out from the poles. I think this is meant to form polar gyres centred around 60 degrees. But in the antarctic, these easterlies are weak because they're small, so the west wind drift bullies them south. In the north, it's all messed up, particularly by the gulf stream entering into the mix. Plus, of course, normal maps don't show the poles in a way that makes sense. Aside from that, when in doubt remember that a) water has momentum and tries to keep going where it's going, and b) if water leaves one place more water will want to go there to take its place. I think it is better, yes. I wonder whether maybe the south coast of mistaya may be a good place for a monsoon current? It's sort of of the borderline I think between an equatorial and a western boundar current, and seasonal effects may make the difference. I don't know, I admit I don't understand monsoon currents and when exactly they occur and when they don't. Don't forget there are also equatorial countercurrents, which may play a role there. At the south pole, I think you'll probably get a current headed west underneath that west wind drift, and this'll probably go under those islands there on the left. However, this may interact oddly with the west wind drift, and I wonder whether at those islands the WWD may be split and part of it form some sort of gyre with the east wind drift? Likewise at the north, I wouldn't be surprised if some small gyres formed in the arctic, like our beaufort gyre. But for climate, I don't think this matters all that much. Salmoneus wrote: I think it is better, yes. Salmoneus wrote: I wonder whether maybe the south coast of mistaya may be a good place for a monsoon current? It's sort of of the borderline I think between an equatorial and a western boundary current, and seasonal effects may make the difference. I don't know, I admit I don't understand monsoon currents and when exactly they occur and when they don't. Salmoneus wrote: Don't forget there are also equatorial countercurrents, which may play a role there. 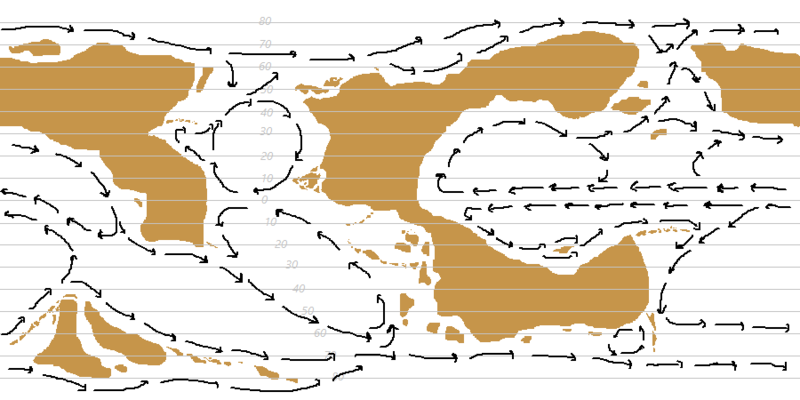 Would those run eastward between the westward moving currents around the equator, at around 5-10 degrees north/south of the equator, forming "miniature" gyres at either end (if I looked at a current map of Earth, that seems to be what's going on on the eastern Pacific coast, but I could be wrong). Salmoneus wrote: At the south pole, I think you'll probably get a current headed west underneath that west wind drift, and this'll probably go under those islands there on the left. However, this may interact oddly with the west wind drift, and I wonder whether at those islands the WWD may be split and part of it form some sort of gyre with the east wind drift? Yeah, I've only just realised I missed the westward polar currents. It could get a bit interesting, but as you said, in terms of climate it wouldn't seem to matter too much. Dark blue horizontal lines indicate the low pressure ITCZ, red indicates the high pressure STHZ while light blue indicates the low pressure PF. Red circles indicate what I think would be the rough centre of continental high pressure zones while blue circles would indicate continental low pressure zones. The central black line marks the boundary between the northern and southern pressure systems. Now, I'm completely stuck on where to go from here and exactly how the pressure zones would interact with each other. Bricka tends only to discuss pressures and wind directions in and around the STHZ, rather than in the PF or the ITCZ, so I'm going to assume that either a) there isn't much of a difference in those areas between the summer and winter months and that the major differences occur in the STHZ or that b) Bricka's information on the subject is lacking. Just another question as an aside. I'm thinking that this world will have two moons, rather than a single moon. Other than the effect this situation would have on ocean tides, would it have any effect over larger oceanic currents or wind systems, or any effect over the climate at all? Do temperature first, then pressure (would be my opinion, can't remember what geoff says). Start with (theoretical) horizontal lines for temperature gradient. Then deflect them. Start with the line of greatest heat - going from west to east, move the line rapidly further from the equator over land in summer, and closer to the equator over land in the winter (resetting to the 'correct' position more slowly over the ocean) - note that sometimes this line will start resetting before you get to the coast, if your coastline is angled the right way - cf south america). Taking account of currents while you do so - obviously, warmer water moving poleward will warm adjacent coasts, vice versa with cold currents - and currents 'hitting' the coast are more effective at changing temperature than currents just flowing past. Remember that this will have more effect in the 'opposite' season, as it were - in summer, the effect of warm currents is reduced and that of cold currents increased and vice versa (naturally - if it's cold and wintry, the cold wintry current from the cold and wintry place differs less from the surrounding temperature, whereas in the heat of summer that cold water is very out-of-place, and thus will have a bigger effect). And also, of course, mountains - mountains will tend to be colder than surrounding areas. Then do horizontal lines parallel to the line of greatest heat. And then deflect them in the same manner, from west to east. Pressure can then begin with the basic high and low pressure zones, although again, don't just think of them as 'high' vs 'low' - they're gradients. So a series of graded parallel lines (may be worth putting in a few coloured lines along the way to act as isobars - or you can do what geoff does and arbitrarily divide 'high' from 'low' pressure, but remember that this isn't really a binary distinction). These pressure lines also deflect - not based on land position per se, but based on temperature - the pressure lines (seen from the equator) will move to include hotter areas, and move to avoid colder areas. Ach, damn it, now I'm working it out. I'll probably not show you mine until you've done your version, though.